Hardly any cooking yesterday — been sick for most of this week dealing with a sore throat/full-blown cold. I think I’m on the mend. Thank god for Nyquil, ginger tea and soup. Had takeout Indian Friday night — bhel puri, malai kofta, dal and rice. This is NOT a blog of a vegetarian by the way. 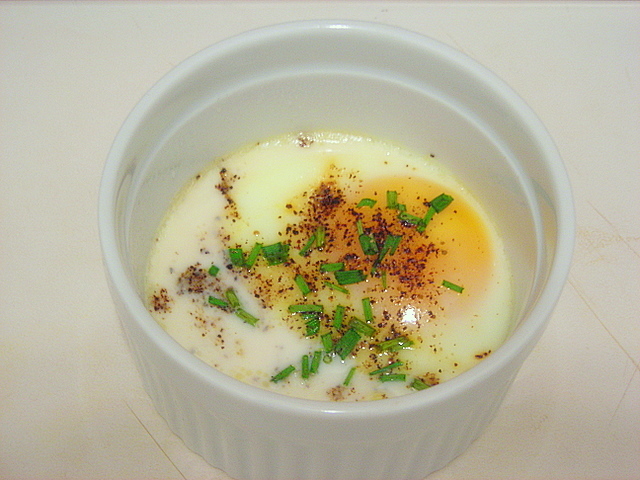 Grease a ramekin or custard cup with unsalted butter. Break an egg inside. Top off with 1 T. light cream to prevent the egg from drying out. Add salt and pepper to taste. Bake for 10 to 15 minutes or until egg white has set and yolk is just beginning to harden. Serve at once. That’s the basic recipe. Toppings include anything from chopped herbs to salsa to grated cheese to ham or crumbled chorizo…the sky’s the limit. 25 May	This entry was published on May 25, 2008 at 4:47 am and is filed under food, general. Bookmark the permalink. Follow any comments here with the RSS feed for this post. Chicken Kasha &/or equal amounts of Hot & Sour…do it every time…get well! I’m trying this right now. I’m waiting for the oven to heat. Will report back in a little while.